September is usually the month where things slowly return to normality, the emphasis being on slowly. Everyone is back from their annual holidays, schools are starting again and universities are getting busy preparing for the arrival of a new intake of freshers and the return of second and third year students. Yet this year, September is quickly shaping up to be rather busier for me than usual. Work is the busiest it has been since I started my new job in Brussels. After my first day back after my holidays, it pretty much felt like I had never left and I spent part of my first weekend back in Brussels in the office. I also realised the other day that I am away for every single September weekend for one reason or another (various work related events in Switzerland and the Netherlands, a wedding in Copenhagen, a trip home to Germany to visit my family and a weekend in Turin to see Alessandro who is studying there for the next year). As I am really enjoying my job at the moment and I love to travel I can’t really complain. It does mean however, that, at least for this month, the time I can spend on my sofa reading a good book with a cup of tea and one or two of these Oat and Cardamom Florentines is rather limited. A pity really, because as much as I hate how rainy Brussels can be, there is hardly anything better than sitting on your sofa, book in your lap, listening to the rain drum against the window panes, warming your hands on a cup of tea and getting your teeth stuck on one of these chewy little cookies. Florentines, little disk-shaped cookies typically studded with slivered almonds, candied peel and glace cherries, one side usually covered in dark chocolate, always feel like a bit of a decadent treat to me. Maybe because they tend to be the kind of thing overpriced delis stock. 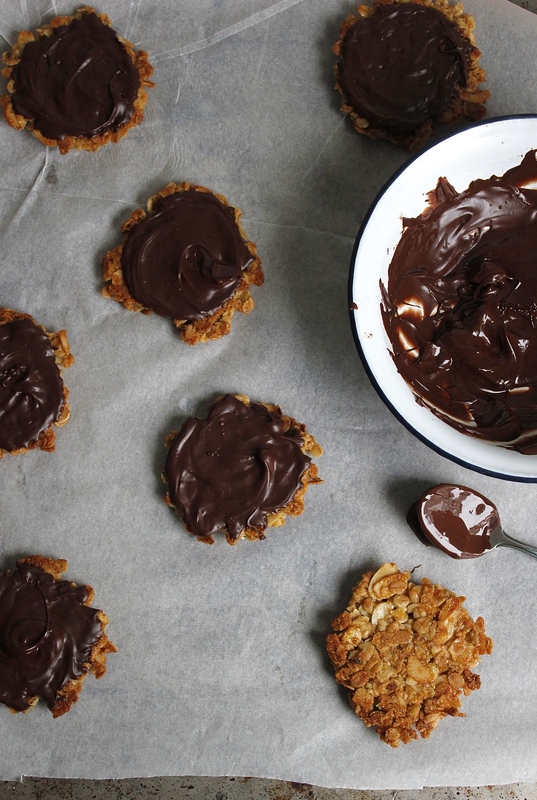 Yet it is actually easy (and cheap) to make Florentines at home. They are a one bowl affair (2 if you go for the chocolate coating, which, admittedly, you should, as Florentines are even more delicious when the sweet and chewy cookies contrast with the snap and slightly bitter flavour of a thin layer of dark chocolate on one side of the cookie). And they come together in no time at all. Florentines come in many shapes and sizes – thin and lacy not unlike brandy snaps, somewhat thick and chewy, almost like an oatmeal cookie, and with a myriad of combinations of different nuts and dried or candied fruit. So much so that I had no qualms whatsoever with taking a rather minimalist approach and coming up with a recipe that leaves out the fruit entirely. I took these Florentines to a friend’s party the other day and while I was initially worried they would not be to everyone’s liking (cardamom tends to be a divisive flavour), the plate of Florentines was finished in no time at all. I clearly should not have worried whether people would like them. Instead, I should have made a double batch as one of my friends had high hopes I had only brought a sampler of these Florentines and had additional supplies hiding at home. Note: traditional recipes tend to include dried fruit and/or candied peel. I have not tried adding dried fruit or candied peel to the below recipe but I reckon you could get away with adding about 50g in total of dried fruit and/or candied peel. If you would like to add more, I would reduce the weight of oats and almond slivers in proportion (otherwise you would have to adjust the weight of the sugar, honey and butter to ensure the mixture still holds together). Pre-heat the oven to 180 degrees Celsius and line 2 sheet pans with parchment paper. In a medium-sized saucepan melt the butter, honey and light brown sugar. Once the mixture is melted completely, take the saucepan off the heat. Add the oats, slivered almonds, spelt flour, pinch of salt and ground cardamom and stir to combine. Set aside for 10 minutes (this will help the mixture stick together a bit better, making it easier to shape the Florentines). Using a tablespoon drop 6 mounds of the mixture on each sheet pan, leaving some space for the Florentines to spread. Using your hands gently coax the little mounds into round cookies, flattening them slightly as you go along. Bake for 10-12 minutes until the edges are just starting to colour and crisp up. Let the Florentines cool on the sheet pan for 5 minutes before carefully moving them to a cookie rack to cool completely. Once the Florentines have cooled down to room temperature, melt half the chocolate in a bowl over a pot of simmering water. Remove the bowl from the pot and add the remaining half of the chocolate. Once all the chocolate is melted, spoon a generous teaspoon worth of melted chocolate on the back of each Florentine, spreading it out to the edge of the Florentines with the back of the spoon. Set aside for the chocolate to set. These look like a great variation the classic Florentine. Love oats and love cardamon. Thank you Daniel – I definitely have a weak spot for oats and cardamom as well! Gosh, what a busy September you have planned! I am terrible at seeing a lot of Europe so I really should take some inspiration from you and book some weekend getaways. I love the sound of these florentines – I never find them a very exciting biscuit but the flavours you have used here are calling to me. Thank you Kathryn – busy times indeed (work has just thrown in another trip on top of those …). Although, everything pales in comparison to your recent cross-Atlantic journeys! I always go back and forth between trying to explore Europe more and making the most of time off to travel to exotic places – never an easy call. That being said, I am quite excited to be heading back to Zurich again, finally check out Copenhagen and get to know Turin a bit better as well over the next year.